I really hesitated whether or not to post this recipe, first because, is it really possible to photograph chicken salad in an attractive manner? Food mixed up with mayonnaise doesn’t necessarily take good pictures. Second, this chicken salad is just something I have been making for years as my regular lunch. However, I have made this version of chicken salad for a million of those luncheons, you now the ones, where cold cuts, cheese platters and sandwich trays are served. Everyone always loves it, so today I’m sharing it with you. I think you might like it too. This is also one of dishes that tastes better after it has sat in the fridge for a while, the flavors marinating and melding together. It’s also good enough to eat sans the bread over sliced tomatoes, it’s pretty addicting. I like it on toasted bagels too. So give it a whirl, it makes enough to last several days. 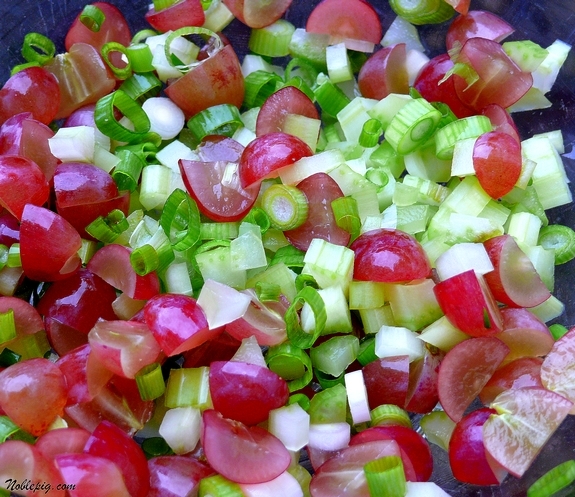 In a large bowl add the celery, scallions, grapes, chicken, mayonnaise, Miracle Whip and Hidden Valley Ranch Seasoning. Mix well. I am sooooo making this! I love chicken salad, with or without the bread. Never thought to add hidden valley ranch mix, great idea. My chicken salad is very basic, I like to add pineapple chunks sometimes and honey mustard, green grapes, celery, and slivered almonds, mayo, s and p, so many versions, such a great dish! Oooooo, my husband adores chicken salad. I usually do red grapes and almonds, or even walnuts. Nothing wrong with that photograph, that’s for sure. 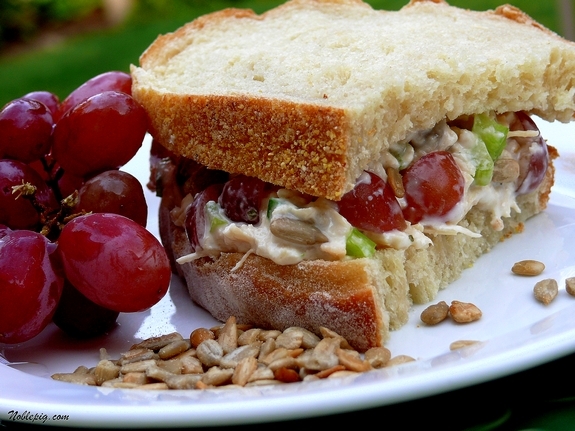 I like the grapes and the toasted sunflower seeds….great flavors and crunch!! I make a similar Chicken Salad. When I was growing up, I thought Miracle Whip WAS mayo. I also use part Miracle Whip and Mayo in my Chicken Salad. I sometimes will throw in a little tarragon. well, yes you can make chicken salad attractive! I love a good chicken salad, and I’m adding this to my list! I think you did a great job with the photograph! I love chicken salad and this looks good. The pictures came out great as well! it is hard to photograph any type of salad, but I gotta give you props as these are really good. I love the stuff in your salad! Sounds yummy! I might have to try that… I’m so picky about chicken salad. My chicken salad is just chicken, miracle whip, crushed pineapple and pecans. My Mother would love you for this post. She has always put grapes in her chicken salad and we all think it’s weird. Maybe it’s not so weird. Sounds delicious! At first look, I thought ewwee. But I’d have to go with mayo and leave out the onions. Then it actually sounds really good–with the sunflower seeds and the ranch dressing. I’ll have to try that. Picture looks great to me. I make a similar version with pecans and it really is delicious. I think I’ll try it next time with the sunflower seeds. I love the addition of grapes and may I say, You did a terrific job of photographing this chicken salad. The pictures truly make me want to run into the kitchen and make this. And I would but I dont have any chicken,… or grapes,…or celery. But I am going to the store today! 🙂 Guess whats for dinner tonight? I love chicken salad but how clever adding the Hidden Valley, I have to try that, thsnks. This is one of my favorite way to prepare chicken. My mouth is watering for a bite of that sandwich. The grapes make all the difference in the appearance; suddenly, it’s not just a tan mass of mayo and chicken. This looks really good. I’ll have this before some apple upside down pie. Thanks. looks good but I don’t care for grapes in a chicken salad, or scallions. But the rest sounds yummy;) hope all is well with you and yours Cathy! i won’t lie–your way is not my way. still looks pretty tasty, so as long as i can look past the mayo, miracle whip, and ranch (yeah, 0 for 3), we’d be okay. Sounds fantastic, love the sunflower seeds in there. Look delicious as always, love the grape addition. It surely add sweetness to it. I love chicken salad w/ grapes! I will definitely try this! This sounds heavenly. I am having a luncheon for my grandughter’s christening and I will make this for the buffet table. I think the photos look amazing. Adding sunflower seeds is a great idea. That looks delicious! We had a deli that made grilled chicken salad with fresh pineapple (and other ingredients). It’s been at least 10 years since I’ve tasted it and I still think about it! I love the grapes and ranch dressing idea! I just love chicken salad with grapes. It’s a must for me. I agree that it tastes better the next day after the flavors all blend together…so good! I love chicken salad this way! Love the crunch and sweetness! Yummy … I make mine the same way, except I use pecans instead of sunflower seeds. Favorite lunch ever. Ok … that upside down apple pie … you just solved my what-to-take-to-the-inlaws-on-Thanksgiving dilemma! Bless you! i m so fond of mayo,going to try this weekend for brunch! There is nothing better than a good chicken sandwich. Yours looks absolutely delicious! Ridiculously delicious, love the secret seasoning of Ranch…brilliant! Cathy, you may have worked around the problem, but your salad looks beautiful to these old eyes. I really like your recipe. Are you kidding? Your sandwich looks great! This is a brilliant salad and looks lovely too. Now that I’m dieting until the holidays I needed something other than Upside Down Apple Pie. You killed me with those pictures. Talk about drool. Ooh. I love the addition of sunflower seeds! Normally I love just about every recipe you post…and this sounded fabulous right up to the Miracle Whip…I despise MW…I do however add honey to my mayonnaise based chicken salad though…so I might give it a try with that combo instead. The ranch dressing sounds interesting! 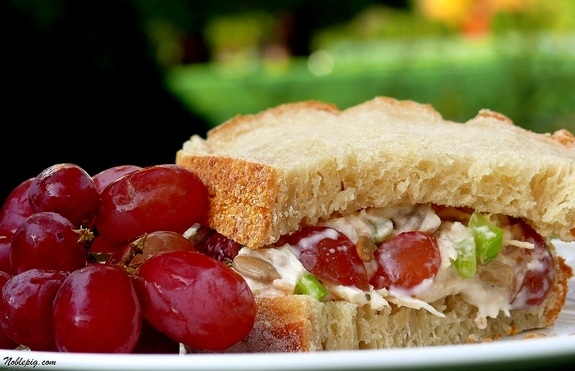 I love chicken salad, especially with grapes! Nice recipe. Oh, those grapes look terrific in there. I bet they really sweeten this up and provide great texture contrast. I also like your mayo, dressing, miracle whip trio. This is a great chix salad! This looks so yummy Cathy. I love the addition of nuts for some crunch! Who doesn’t love Miracle Whip?! Thanks for a great recipe. Chicken and grapes are so good together. Love your blog!! This looks so yummy! MMMMmmmmm. Chicken. Can I have extra chicken in mine? I’ve never been a fan of chicken salad, but this one I would definitely dig into. It looks fantastic! LOve this, but I use 1/2 mayo & 1/2 greek yogurt!